Several global settings may be configured for overall membership management. Click Settings in the left-hand navigation panel. Click Membership Settings in the Services, Products and Commerce section. Membership Removal Does Not Remove Chapters Or Lists: This setting allows you to configure whether contacts are removed from chapters and lists when the membership is dropped. If this option is not selected, contacts are automatically removed when the member if dropped. Prorate Cutoff Day: This option allows you to configure the cutoff day for pro-rated membership dues. The default is 15. If a new membership is added prior to this cut-off, the full month's membership will be charged. If a new membership is added after this cut-off, the new member will not be charged for the month. See Understanding Pro-rating for further information. You system may be configured to automatically assign account and membership numbers to new contact. Click Account and Membership Numbers in the Miscellaneous section. Automatically Assign Account Numbers To Individuals: Enable this option if you wish the system to automatically assign an account number to individual members. Automatically Assign Account Numbers To Organizations: Enable this option if you wish the system to automatically assign an account number to business members. Enforce Account Number Uniqueness: Enable this option to ensure that account numbers assigned are unique. If a number has been assigned to one account and a staff member later tries to edit another account and use that number, they will be alerted. Contact Assignment Trigger Type: Select at what point you wish the account number to be assigned. When created will assign an account number to all contacts in the database, regardless of status. When active will assign an account number when the membership status is active. When active and courtesy will assign an account number when a membership is activated or marked as courtesy. Next Account Number Assigned: This field will keep track of the account numbers to be assigned, and will default to 1. If you wish to start the sequence at a different value (for example: if you are new to the software, and currently have account numbers assigned to your members) enter the starting account number. All subsequent number assignments will key off that starting number and auto populate. Automatically Assign Membership Numbers: Enable this option if you wish the system to automatically assign membership numbers to your members. Enforce Membership Number Uniqueness: Enable this option if you wish to ensure that membership numbers are unique. If a number has been assigned to one account and a staff member later tries to edit another account and use that number, they will be alerted. When to assign: Select at what point you wish the account number to be assigned. When created will assign an account number to all contacts in the database, regardless of status. When approved will assign an account number when the membership status is active. Next Membership Number Assigned: This field will keep track of the membership numbers to be assigned, and will default to 1. If you wish to start the sequence at a different value (for example: if you are new to the software, and currently have membership numbers assigned to your members) enter the starting membership number. All subsequent number assignments will key off that starting number and auto populate. 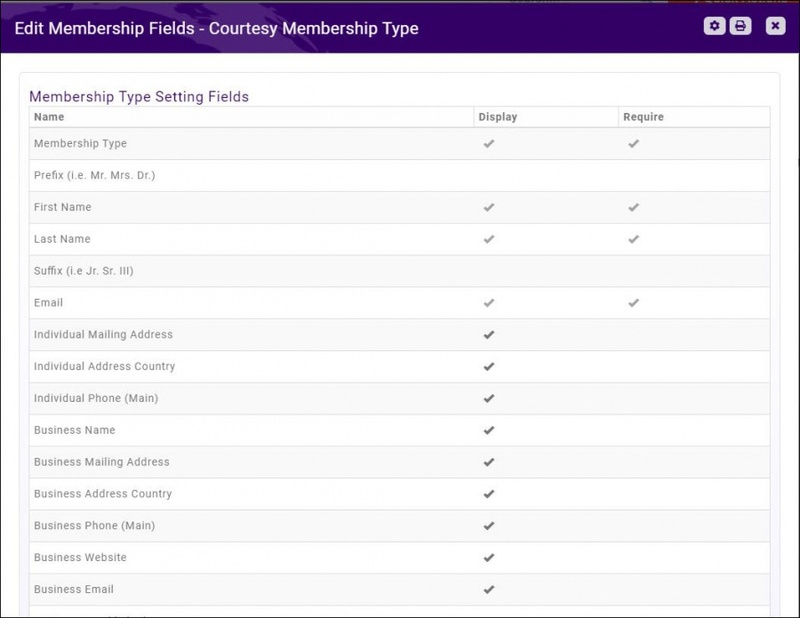 Membership Types allow you to define the membership packages and fee items you wish to provide to your members. These membership types my be included on your membership application form. Click Membership in the Navigation panel. Click the Membership Types tab. A list of membership types currently setup in your system will be displayed. the membership is owned by the business. the membership is owned by an individual. the membership is owned by a family. Name - Enter a name for the new membership type. This is the name that will appear on you member application, as well as within in the database where you may choose a membership type, filter by membership type, report on membership type, etc. Term/Length(Months) - Enter the duration of this membership, in months. The default is set to 12 months. Owned By - This setting allows you to set this membership type as either organization or individual level. If Business is selected, invoices will billed to the organization; if Individual is selected; invoices will be billed to the individual. Membership Category - Membership Categories provide a way to further filter and report on your membership types. Select a Membership Category from the drop-down list, or click the plus sign to add a new membership category. Is Active - enable this option to activate the Membership Type. Best practice, when no longer using a Membership Type, is to de-activate. Allow Multiple Chapter Selection - If you allow applicants to choose more than one chapter when filling out the Membership Application Form, enable this setting. Allow Single Chapter Selection - This option should only be selected if you allow for selection of only one chapter during the application process. (Optional) Calendar Year Renewal - These options allow you to manage when your renewals will occur and manage prorating your fees. Renew Everyone In - This setting allows you to establish the renewal month to be applied to all members. 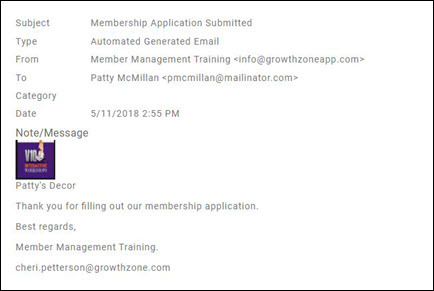 Prorate Partial Years - Selecting this check-box will automate the process of adjusting the membership fees, based on the month that the member joined. NOTE: When applicants are presented with the amount that they are paying on the membership application it will correctly represent the amount that they will pay now as the prorated amount (if applicable) and the amount they will be billed in the future. NOTE: Calendar Year Renewal with or without Prorate enabled is intended to work for memberships with a 12 month term and with standard frequency selections i.e. Monthly, Quarterly, Semi-Annual and Annual) (do not use with Once Per Term Frequency). Refer to Understanding Pro-rating for further details on setting up a pro-rated membership type. Description: Provide description of the membership type. This description may be displayed on your web-site. You may use the standard word processing icons (i.e. bolding, italicizing, etc.) to format the text. You may also add images and/or links to the description. Add Membership Type Levels - COMING SOON! Click the value located in the Pricing column, or if no pricing has been entered yet click the <No Pricing> link. Allow Invoicing - Select this option to allow an applicant to request to be billed for their membership application. Allow Online Payment - Select this option to allow applicants to pay for their membership application by credit card on-line. NOTE: The system will validate that all fields are filled out correctly BEFORE submitting/charging credit cards. Once validation is successful, the system will then proceed with charging the card and submitting/creating the membership. Payment Gateway - Select the desired payment gateway from the drop-down list. If no gateway is selected, the default gateway for your organization will be used. Invoice Template - You may select an invoice template. If no invoice template is selected, the invoice template associated to the fee items will be used. Payment Terms - The default payment terms are selected, and you may select alternate payment terms. You can add new payment terms by clicking the + icon. Terms/Conditions - The default payment terms are selected, and you may select alternate payment terms. You can add new terms and conditions by clicking the + icon. 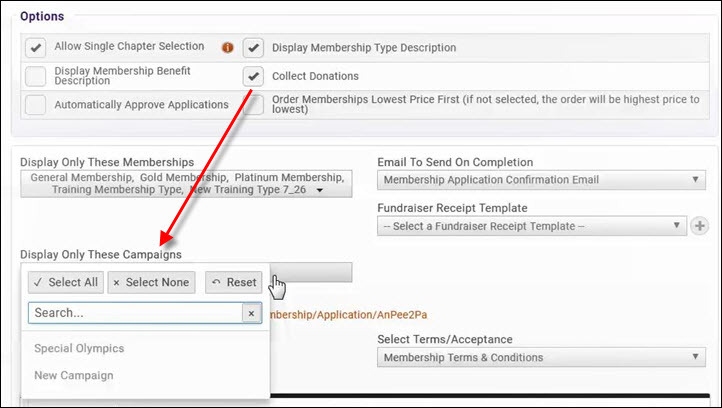 Formula Based Pricing - Click the check-box, if you are setting up a membership type that will use variable dues. Recurring Fees - Recurring fees would include, for example, the annual membership fee. Click the + button to add a recurring fee to this membership type. You may add as many recurring fees as needed. Select a good/service from the Item drop-down list. Select the Billing Schedule for this item. You may choose annually, semi-annually, quarterly or monthly. A Custom option is also available. This may be useful if you wish to define what the price would be for each frequency option. See the custom billing frequency section for further details. Select the Hide on Invoice check-box if you do not wish to display this item on the invoice. If this option is selected, the amount of the item will be added to the first visible line item on the invoice. NOTE: If viewing the invoice in the back office, staff will see all line items regardless of whether the "Hide on Invoice" was selected on the Membership. Setup/One Time Fees - If there are one time fees, such as a setup fee, associated with this membership, you may add them by clicking the + button. Custom billing frequency allows you to charge a different membership rate based upon the frequency that your members wish to pay dues. For example, you may charge $1200/annually, however you may wish to charge $175/month if the member chooses to pay monthly. 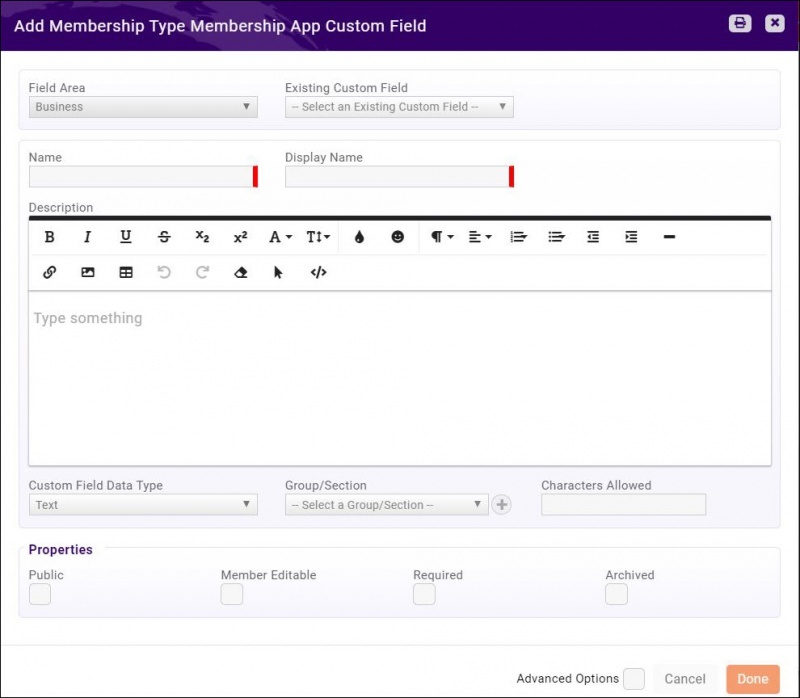 Create a Membership Type as described in Adding a New Membership Type. In the Recurring Fees section, select the fee item to associate to the membership type. Select Custom in the Default Billing Frequency drop-down list. Click the icon, the Edit Fee Item Frequency Prices dialog box will be displayed. 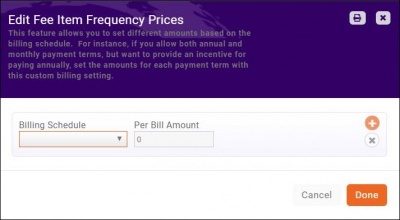 Click the icon to add a billing frequency. Select a Billing Schedule from the drop-down list. Options include annually, monthly, quarterly and semi-annually. Enter the Per Bill Amount for the selected billing schedule. 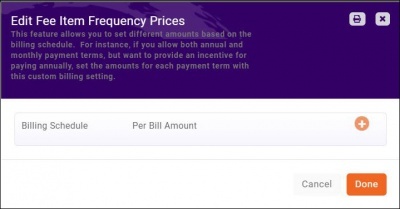 Click the to add another billing frequency and price. Repeat this step to add additional billing frequencies. Complete the setup of your membership type as described in Adding a New Membership Type. When this membership type is presented on your Membership Application, the applicant will be able to choose the billing schedule they would prefer. Scheduled billing will automatically be setup to reflect the billing schedule selected. When setting up your Membership Types, an option is available to set a specific renewal month and to enable pro-rating. The scenarios below explain specific use cases for your pro-rating setup. NOTE: Calendar Year Renewal with or without Prorate enabled is intended to work for memberships with a 12 month term and with standard frequency selections i.e. Monthly, Quarterly, Semi-Annual and Annual. Do NOT use with a Once Per Term Frequency. NOTE: By default, Memberships that have Prorate Partial Years enabled will charge applicants that join on the 1st - 15th of the month for the full month. Applicants joining after the 15th will receive the current month for free but will be charged for the next term. You can change the cutoff day of the month by selecting the Prorate Cutoff Day under Setup > Membership Settings. The default Prorate Cutoff Days is 15. This value is used to determine whether the membership should bill for that month. For Example: Prorate Cutoff Day = 15, a new member signs up on the 3rd, the new member WILL be charged for that month. A new member signs up on the 15th, the new member WILL be charged. A new member signs up on the 20th, the new member WILL NOT be charged for that month. Calendar Year Renewal Month specified, Prorate on, Monthly Frequency: When Renewal Month is specified on your membership type and Prorate is On with Monthly frequency specified, the upfront, initial charge/invoice includes the next month’s amount, so the applicant is always charged for something when they sign on. A new member signs up in February. The new member will be invoiced $100 immediately (for March). The Next Scheduled Billing date will be in April for $100/monthly. Calendar Year Renewal Month specified, Prorate Off, Frequency=Monthly, Quarterly or Semi-Annual: If you have the optional Renewal Month specified for a membership type with Prorate Off and frequency set to Monthly, Quarterly, or Semi-Annual all the previous months' charges will be included in the upfront, initial invoice/charge bill so the applicant is always up to date on the previous months when they sign on as these memberships are NOT being prorated. Calendar Year Renewal specified, Prorate=On, Custom Frequency: The new member will be charged for the amount that is appropriate for the frequency selected, i.e. Monthly would be a monthly amount, quarterly a partial quarterly amount, Semi-annual = a partial semi-annual amount. The pricing varies dependent on one or more factors (numeric inputs). For example, a factor could be the number of employees, number of beds in a hospital, or rooms in a hotel. Multiple variables may be used. The factor is based on information that the member knows (For example: # of employees, # of cattle, # of buildings managed, # of beds, annual revenue). When the membership is a combination of levels and variable pricing. If pricing for each level varies based on one variable input by the customer. For Example: Hotels = Base price of $435 + $7/additional sleeping rooms above 55. If pricing for each level varies based on multiple variable input by the customer. For Example: Employees = ($10 per full-time employee) + ($5 per part-time employee) with a max price of $1,000. Determine which fields are needed for your formula (i.e. full-time employees, part time employees, number of beds, number of cattle, etc.). Create the custom fields needed to calculate your variable dues. For example, if your variable dues are based on a number of employees, you will need to create this as a custom fields. See Setup Membership Application Form Fields/Questions for instructions. Custom fields created as decimal or integer type will be available when setting up your calculations. Create your membership type(s). See Add a New Membership Type for instructions. For the desired membership type, click the <No Pricing> link, in the Pricing Column. Click the Formula Based Pricing check-box. See Add Pricing to a Membership for information on additional fields. Select the fee item from the Item list. The Description, Price, and Frequency fields will be populated based on the defaults configured when the fee item was set up. The price you select would be the base price for the membership. NOTE: A base price is NOT required and pricing could simply be based on your formula calculations. Click the next to the Price text box to add the variables required by your formula. For example this would be where you would choose full time employees as the variables needed in your calculation, as well as enter the amount to be charged for those employees. If you would like to set a maximum price for this membership, enter it in the Maximum Price (optional) field. This will set a "cap" on the total fees that a member will incur. Click the to add your variables (custom fields) and setup the formula calculations. Select the field to be used in your calculation from the Unit Field list. Custom fields that are integers or decimal will be listed. Enter a Unit Price. This is the dollar value that will be used to calculate the dues. For example, if you will charge one dollar for each full-time employee, enter 1. Enter the Base Units Included in Price. Entering a “base unit included in price” will subtract this number from the amount entered in the field and the calculation will occur on a value greater than 1. For example, if there are 100 full time employees and 55 are included in the base, the calculation will occur on the remaining 45. Repeat steps 7 - 10 above to add additional calculations. In the example shown below, for each full-time employee over 50, the system will multiply by $1.00 and add the result to the base price (if applicable). For each part-time employee over 25, the system will multiply by $.50 and add the result to the base price (if applicable). NOTE: Custom Calculations: If a calculation is more complex that what is allow here, GrowthZone can write a custom calculation script for it. These calculations must be reviewed in advance by our product/development team before any commitment that it can be scripted. GrowthZone may assess fees for custom calculations. 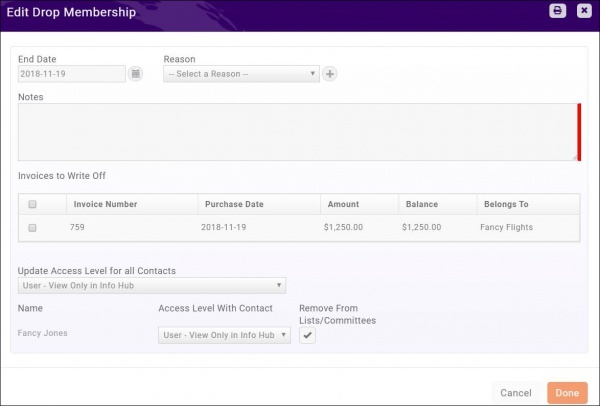 With your variable dues, you have the ability to "auto-assign" levels to your members. Assignment is based on one of the factors included in your formula. For example, include full-time employees in your formula, then create levels (such as 1 - 50 employees, 51 - 100 employees, etc.). When the number of full-time employees is enter by the applicant on your application form, or by your staff through the back-office enter, the system will automatically assign the member to the correct level. On the Membership Type tab, click the <No Levels> link in the Levels column, for the membership to which you wish to add levels. NOTE: If you have already added levels, click the numbered link. Select the field to be used for assigning levels from the Field Used to Determine Level (Min and Max are set with with each level) list. Fields displayed are those you have selected for your variable dues formula. In the Levels section, click the icon, to add levels. Enter a Name for the level. Add Fees if applicable, however, with variable dues, fees are configured under the Pricing functions. If fees are added, these fees would be in addition to the fees assigned under pricing. Repeat steps 4 - 7 above to add additional levels. 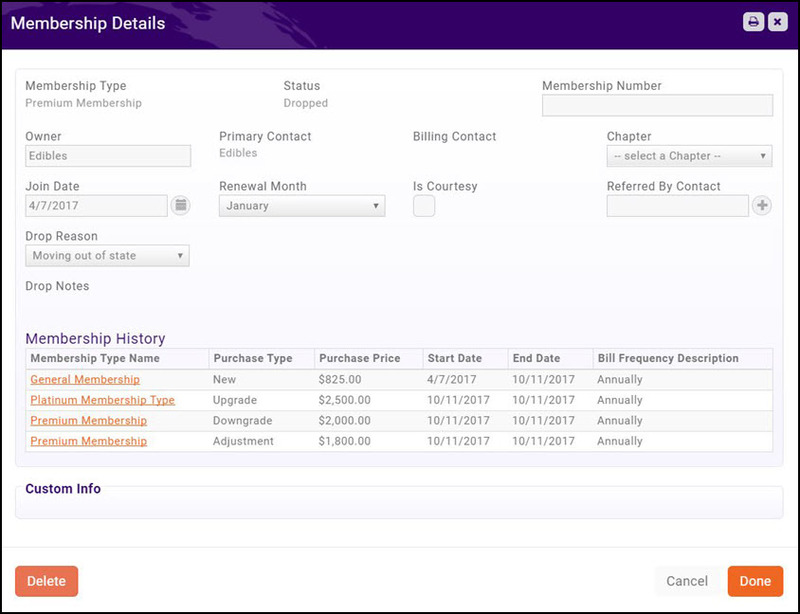 When an applicant selects a membership type that includes variable dues, on the second page of the Membership Application for, a section called Information for Dues Calculations will be displayed. These are the custom fields you created as numeric input to the dues formula. Based on the input into these fields, the system will calculate the appropriate dues. 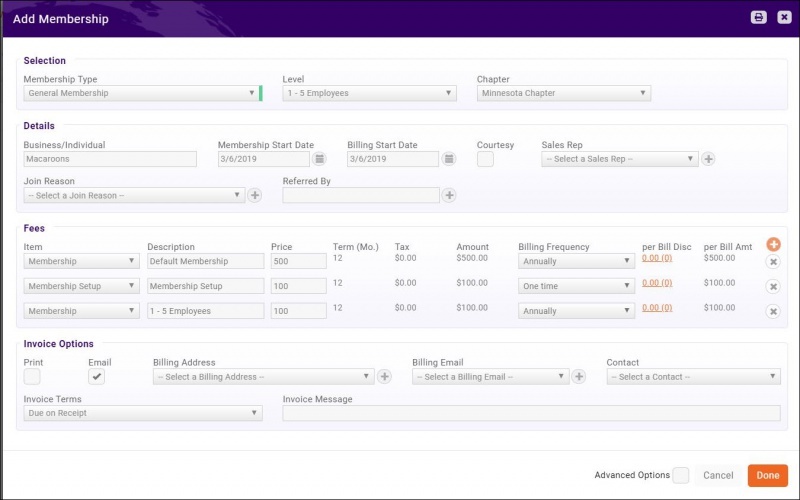 When adding a membership for which pricing is setup on a formula, an Information for Dues Calculation section will be displayed on the Add a Membership screen. Your staff will enter the appropriate values, and the system will calculate the additional fees based on the formula setup for the membership type. See Add a Membership to a Contact for further information on adding memberships. Changes to the variables may be made when upgrading and downgrading the membership. Membership Types may associate to a particular Directory, and to a set of Directory Display Settings. Directory Display Settings control what information about a business or individual is displayed if you choose to publish a directory of members to your website. You may, perhaps, have different levels of listings based on membership type. A basic level might include just a business name and a logo, where as an enhanced listing may include photo galleries, videos, maps, etc. Click the numbered link or the <No Directories/Categories> link in the Directories/Categories column for the Membership Type to which you wish to associate directories/categories. Directory Listing: Click the to add a directory, and directory display settings to this Membership Type. Select the Directory you want the members of this membership type to be included on. Select the Directory Display that is automatically assigned to the member with this membership type. If needed, click the to add a new directory display. Click Here for further information on Directory Display Settings. Display Directory Categories: Check the box to display directory categories to your members on the membership application and the Info Hub. Click the icon to configure the directory categories for this membership type. Choose the Category List you want your members to choose from. If needed, you are also able to select a minimum and maximum number of categories that each member is able to select. Directory Display Settings control what information about a business or individual is displayed if you choose to publish a directory of members to your website. You may, perhaps, have different levels of listings based on membership type. A basic level might include just a business name and a logo, where as an enhanced listing may include photo galleries, videos, maps, etc. Click Directory Display Settings in the Website section. You system will be populated with the Standard Listing and the Deluxe Listing listing types. You may use these as designed or click the hyper-linked name of a listing to edit. Show Individual Details - Select which details for your individuals will be displayed when this directory display setting is used. NOTE: When address, email and phone are selected, you can then choose which address type (i.e. mailing, physical, etc. ), which email type (work, personal, etc.) and which phone type (main, toll, etc.) you will display with this listing type. Show Custom Fields - Select the custom fields you want to display in the directory. Show Related Contacts - If selected, all of the individual associated to the member will be displayed on in the directory. NOTE: If an individual does not wish to be displayed in the directory, you may disable the Show as Related or Primary Contact in directory (if applicable) setting for that contact. Show Search Description - If selected, you will be able to add a short description to be displayed on the directory search page. Show Gallery - If selected, the member may display a gallery of photos on the web-page. Show Video - if selected, the member may display a video on the web-page. Show Map - if selected, the location of the organization will be displayed on map on the web-page. Show Primary Contact - if selected, the name of the primary contact will be displayed on the web-page. Use Contacts Website for Listing page - If selected, clicking on the member on your public web-page will lead to the contacts website, instead of your page. Applicable only when assigned to a public directory (not available in the Hub). Google Tag Manager Container ID - Enter the Container Id you were provided on installation of Google Tag Manager. Google Tag Manager is a free tool that makes it easy for marketers to add and update website tags -- including conversion tracking, site analytics, re-marketing, and more—with just a few clicks, and without needing to edit your website code. This would be one membership type (Small Business Membership) with 3 levels. The selection is based on information that the member knows (Seats in the restaurant, # of Employees, etc.) or based purely on the desires of the member (Gold, Silver, etc.). NOTE: You may add up to 50 levels to a Membership Type. 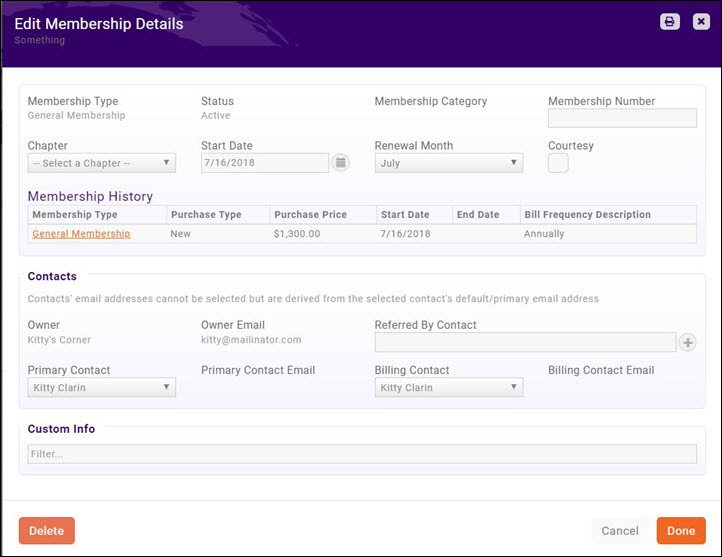 In the Membership module, click the Membership Types tab. In the Levels column, click the <No Levels> link in the row for the membership you wish to add levels to. NOTE: if levels have already been added to a membership type, click the numbered link in the Levels column. Click the to add a level. Enter a Name for the level. This name will be displayed for selection on your membership application form. Do not repeat the Membership Type Name as the Level Name NOTE: Names may be unique but are not required to be unique per Membership Type. 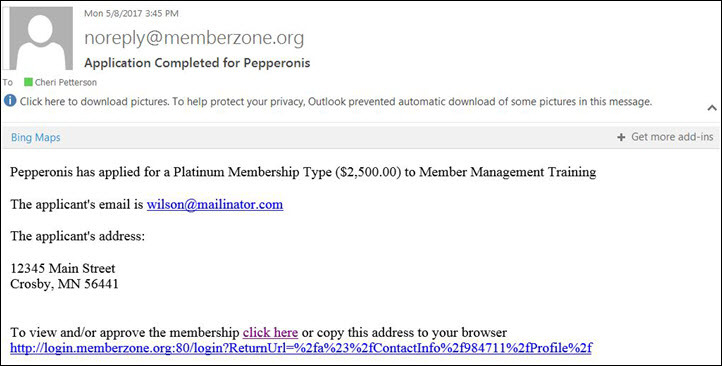 Click the icon to add Recurring Fees to this membership level. NOTE: If you have set pricing for the membership type, the recurring fees set for the level are in addition to the base fees. It is not necessary to create a base fee. See Add Pricing to a Membership Type for further information. When invoicing, two line items would be displayed: one for the base fee, and one for the level fee. Select the desired fee item from the drop-down list. If needed, click the icon to add a new fee item. Each level may re-use the same Goods/Service Item if desired but do not have to. Best practice: Select Goods/Service based on how your account wishes to track income. If income is to be tracked for each individual level, select different Goods/Services. If no breakout is needed, you can use the same Goods/Service. The Description of the fee item will be populated with the description provided when the fee item was configured. The Description is what is displayed on the invoice.NOTE: The Membership name would include Type+Level+Chapter where applicable. The Price will be populated with the price set when the fee items was configured. You may change this if you wish. 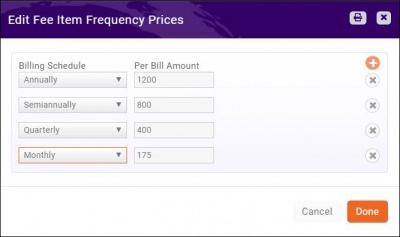 The Default Billing Frequency will be populated with the frequency configured when the fee item was setup. You may change this if you wish. NOTE: If you have setup base pricing for this membership type, the frequency defined at the base level will be displayed. If you change the frequency for a level, it will also change the frequency of the base pricing, as well as the frequency for any previously created levels. Repeat Step 5 above to add additional recurring fees. If you wish to add Setup/One-Time Fees click the icon. NOTE: If you have set one time fees for the membership type, the one time fees set for the level are in addition to the one time base fees. See Add Pricing to a Membership Type for further information. Select the desired fee item from the drop-down list. If needed, click the icon to add a new fee item. The Description of the fee item will be populated with the description provided when the fee item was configured. You may change this if you wish. Repeat step 7 above if you wish to add additional one time fees. Repeat steps 2 - 8 above to add additional levels to your membership type. You may add up to 50 levels. If you choose to include this membership type on your Membership Application form, applicants will be able to select the desired level from a drop-down list. The levels, their name and pricing will be displayed. NOTE: If you have enabled the Hide Pricing on Membership Selection option for your Membership Application form, pricing will not be displayed on the first page of the application. If enabled, pricing will only be displayed once a member reaches the payment page. See View/Create your Membership Application Form for further information. Additionally, when adding a membership from the back-office, you will have the ability to assign the level. See Add A Membership to a Contact for details. The membership level will display on the contact's Profile tab in the Memberships section. The Membership name will reflect Type+Level+Chapter if applicable. Membership Type levels may be adjusted when you upgrade, downgrade or re-activate a Membership. See Managing Membership Change for instructions. When it is necessary to increase the pricing of your levels, you will update the pricing from the Membership module. NOTE: Price changes will only take effect on a go forward basis. Memberships that have already been assigned, and for which a recurring fees schedule has already been created will NOT be updated. These price changes will need to be done on a case by case basis. See Adjust a Contact's Membership Pricing for instructions. Click Memberships in the left-hand navigation panel. Click the Membership Types tab. Click the numbered link, in the Levels column for the desired membership type. Click the link(s) for the level(s) that you wish to update. The Membership Type Name and Membership Level (and Chapter selection if applicable) in the output in the Membership column. An additional field called Levels that can be added to any membership report so you can sort by Levels. The Contact Report includes the Membership Name (Type+Level+Chapter) as the default when viewing the Membership Type results. See Contacts Report. 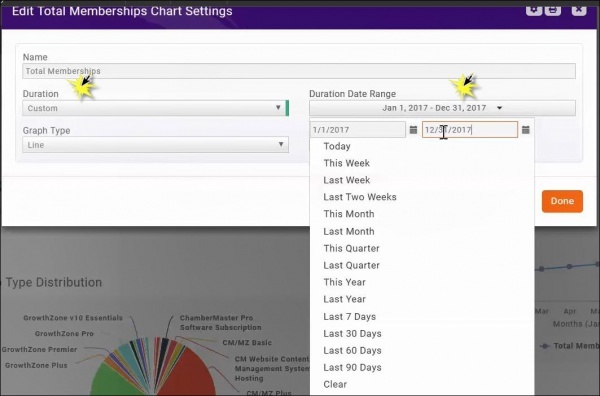 The Membership Level Conversion Tool will be available in the software as early as March 19, 2019. 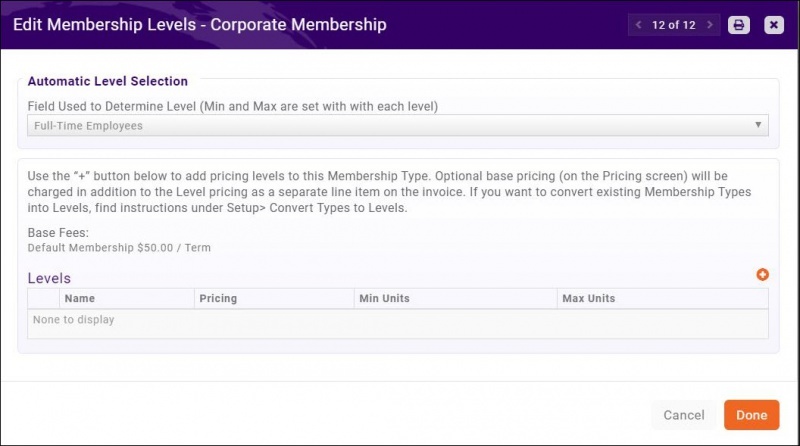 The Membership Level Conversion Tool can be used to convert existing Membership Types (those types created prior to the introduction of levels) to levels. For Example: If you have created distinct membership types for General Membership Type 1-5 Employees, General Membership Type 6 - 20 Employees, etc., these distinct membership types can be converted to a single membership type with multiple levels. NOTE: The Membership Level Conversion Tool is to be used by those organizations who created membership types suitable for levels, prior to the introduction of Membership Levels. If you have not previously created membership types, and wish to create membership types with levels, see Add a New Membership Types for instructions. Create brand-new membership type(s) first. See Add a New Membership Types for instructions. Once your new Membership Type(s) is created, add the desired levels and pricing. See Setup Membership Type Levels setup for details. Convert your current membership types to levels living underneath that new membership type, as described below. Click Convert Types to Levels in the Miscellaneous section. Select the Current Membership Type that you wish to convert. Select the New Membership Type to which you wish to associate the current membership type. Select the Existing Level to which your current membership type should be converted. In the image shown below, the Bronze Membership type, will be converted to the Bronze Level underneath the Small Business Membership type. To add additional membership types to the conversion, click the icon, and repeat steps 3 - 5 above. Membership Application: Update your Membership Application to display the correct membership types. See View/Create Your Membership Application Form for further information. Membership Types Event Discounts: If you are using Membership Type discounts, you may need to adjust the specified membership types to allow your members to access those benefits. NOTE: Event Discounts cannot be assigned to a specific level, only the Membership Type. See Setup Discounts for Your Events for further information. Membership Type Descriptions: Once converted to a level, your previous descriptions will no longer be displayed on your membership application. You may need to evaluate your new membership type description to ensure it accurately describes your levels. Invoice Line Item Description: The description shown on your members’ invoices will come from the Description on each Membership Level line Item. Evaluate if your invoice descriptions need updating. Click the icon in the Fields column. For each of the fields in the standard list, you can configure whether these are displayed on the application for, as well as whether they are required. Membership Application Custom Fields: You may add additional fields to your application by clicking the icon. 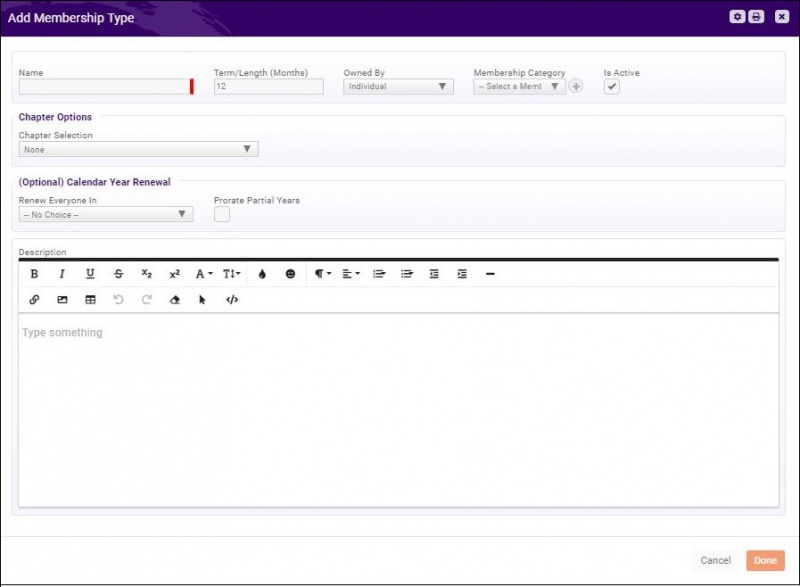 Click Here for further information on configuring custom fields. NOTE: Custom Fields will be displayed on the Membership Details screen, accessible from the Membership section on a contact's Profile tab, as well as on the contacts More Info tab. Repeat Step 5 above to add additional custom fields. (Optional) Click the Advanced Options check-box to add custom fields that are an attribute of the Memberhhip Type itself. These fields are not included on the application form, but may be for internal use. For Example: You may include a yes/no checkbox custom field that indicates if it should or should not sync with an API. A default application form is setup in your system. You may use it as it is configured, or you may customize to better meet your needs. NOTE: The questions included on your membership application form are driven by the field that you have have associated to your membership types. See Setup Membership Application Form Fields/Questions for further information. Click the Membership Application Forms tab. A list of Membership Application Forms currently setup in your system will be displayed. Name - Provide a name for the application form. This name is used internally. 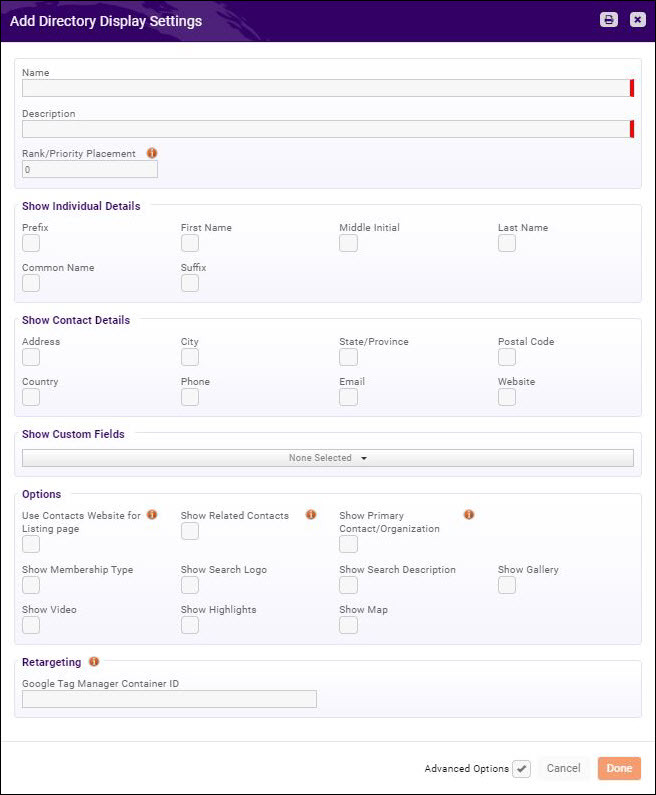 Description - Provide a description of the application form. This description is used internally. Collect Donations - Select this check-box if you would like to collect donations to your fundraisers from the individuals completing the application form. If selected, you will have the option to select the campaigns you wish to display on your application from the Display Only These Campaigns drop-down list. Display Membership Type Description - Select this check-box if you would like the membership type description to be displayed on the application form. Allow Single Chapter Selection - If you are using Chapters, select this check-box to allow applicants to select their chapter when filling in the application form. This option should only be selected if you allow for selection of only one chapter during the application process. NOTE: Selecting this option allows for ONE chapter selection only. If multiple chapter selection is needed, you must enable Allow Multiple Chapter Selections within the Membership Type. Display Membership Benefit Description - Select this check-box is you would like to display benefit package information on the application. Automatically Approve Applications - Select this check-box if you want to automatically approve on-line applications. If this is not selected, the new applicant will be available in your database, but their membership status will be listed as Pending Approval until a staff member has approved. Order Memberships Lowest Price First (if not selected, the order will be highest price to lowest) - Select this option if you wish to order your memberships from lowest price to highest price when displayed on your web-site. If not selected, the order will be highest to lowest. Hide Pricing on Membership Selection: Enable this option if you do not wish to show membership prices on the first page of your application form. If enabled, pricing will only be displayed once a member reaches the payment page. Collect Lists/Committees Subscriptions: If selected, the lists/committees that you have configured as Public Can Join will be displayed on the application form. Applicants would then be able to select the groups they wish to join. Display Only These Memberships - This option allows you to select which memberships to display on-line. By default, all memberships will be displayed, but you may change this if you wish to not display only certain memberships on your application form. Email To Send On Completion - An email will be automatically sent to the applicant when the complete the application. Select the email you wish to send from the drop-down list. A default Membership Application Confirmation Email template is selected, however, you may select a different template. Click here Communications Basics - Create and Manage Email Templates for further details on working with email templates. Instructions - Enter the instructions that you would like to display on the application form. You may use the standard word processing icons (i.e. bolding, italicizing, etc.) to format the text. You may also add images and/or links to the instructions. Completion Message - Enter the message you would like to appear when the applicant completes the application. You may use the standard word processing icons (i.e. bolding, italicizing, etc.) to format the text. You may also add images and/or links to the message. Additional settings for the Member Application Form may be displayed by clicking the Advanced Options check-box. Completion Page Url (Ex: http://www.msn.com) - Enter the URL of the page you would like the applicant to be sent to after completing the application. After Completion, Create a new Hub account - Select this checkbox if you would like the applicant to create their log-in to the Info Hub after submitting the application. A Create an Account in the Hub button will be included on the application submitted confirmation page. Destination Url within Hub (empty if Home) - You may enter a page specific URL for the Info Hub. For example, if you would like them to land on the account tab. If this is left blank, the page will open on the home page. URL - The URL for the membership application form is displayed. You make click on it to preview our application form. Click Done to save the application form. NOTE: In addition to the fields you have selected to display on your application form, lists/committees for which you have enabled Users Can Join and/or Public Can Join will be included on your application form. Click Here for information on creating/configuring your groups. The applicant will receive an email confirmation. The email sent will either be the email you have selected in the advanced options of your membership application form, or the default you set in Automated Messaging. Email is sent to address associated with the person who submitted the application. Those staff members who have subscribed to Membership Application Submitted notification will receive an email. Once a membership application form is submitted on-line, an automated email will be sent to those who have subscribed to the Membership Application Submitted notification. The default email notification is shown below. Click Here to learn how to setup your Membership Applications for automated approval. If you have chosen to not automatically approve on-line membership applications, you will need to approve the applications when they are submitted. You can approve the new membership application on the contact's Profile tab. The status of the application will be displayed as Pending Approval in the Membership section. Click the down arrow on the Actions button in the Membership section. The status of the membership on the profile tab will change to Active. The active date will reflect the day the application was submitted. By clicking on the member name, you can view further details of the member, and approve the membership application by clicking the Actions button and selecting Approve Membership. Click Membership Join Reasons in the Services, Products and Commerce section. A list of currently configured join reasons will be displayed. Reason: Enter your customized join reason. Description: (Optional) Enter a description of the join reason. Standard Join Reason: Select a standard join reason. Standard join reasons are those populated to the database by default and allow for better reporting and filtering. Click Membership Drop Reasons in the Services, Products and Commerce section. A list of currently configured drop reasons will be displayed. NOTE: The system is populated with several standard drop reasons (Financial/Economic Reasons - Cannot Afford, Closed/Death/Moved - No Longer in Business, Not Using Benefits - Not Using Benefits, Other). Reason: Enter your custom drop reason. Description: (Optional) Enter further description of this drop reason. Standard Drop Reason: Select a standard drop reason. The standard drop reasons are pre-populated in your system and allow for better reporting on why your members may have dropped. Available to Public: Enable the available to public if you wish this drop reason to be displayed when a member chooses not to renew their membership . This is applicable when you are using Renewal Notifications for your membership renewals. This setting will NOT display if the Standard Drop Reason selected above is set to Expired. Click Membership Drop Reasons in the Services, Products and Commerce section. A list of currently configured drop reasons will be displayed. Click the hyper-link for the drop reason you wish to update. While most of your prospective members may apply on-line, you can also add memberships to your contacts directly in the database. NOTE: For organization based memberships, ensure that you have individual contacts assigned to the organization prior to adding memberships. The steps below may be followed whether you are adding a membership to an organization or an individual. On a Contact's Profile tab. Click the icon in the Memberships section. Membership Type - Select the desired membership type from the drop-down list. The list will be populated with the membership types you have configured for your system. See Adding a Membership Type for instruction on configuring your membership types. Level: If the Membership Type selected includes levels, the Levels list will be displayed. Select the desired level from the list. See Setup Membership Type Levels for further information. Chapter: If using the Chapter module, the Chapter list will be displayed. Select the desired chapter. Start Date - Select the start date for this new membership. The date will default to the current date, and the system will automatically generate an invoice. You may start the membership on a future date if needed. Billing Start Date - Select the first billing date for the new membership. The date will default to the current date. The system will create a recurring schedule base on the billing start date. Is Courtesy - Select this check-box if this is a courtesy membership. The status of the membership will be Courtesy instead of Active. Sales Rep - (Optional) Select the Sales Rep for this new member. This will allow you to track whom on your staff was responsible for this sale. Join Reason (Optional) Select a Join Reason from the drop-down list. You can add a new Join reason by clicking the + button. Reports can be generated based on Join Reason, to help you in understanding what you new members are looking for from your organization. Chapter - If you organization uses chapters, select the chapter of the new member from the drop-down list. Referred By - If this new member was referred by an existing contact, you can enter the contact's name here. The referral will be noted on the members profile, as well as listed on the Activity tab of the person who referred. NOTE: You can use the Membership Referral Report to view and analyze all referrals. Click Here for information on generating this report. Fees - The fees section will be automatically populated with the fees that you have associated to the Membership Type, Level and/or Chapter. You may over-ride the fees as necessary, for example, if you wish to change the billing frequency from Annually to Monthly. NOTE: Fee and frequency selection will automatically set up the Billing Fees and Schedule on the members Billing tab. The Per Bill Amount and the Per Bill Discount fields will automatically be populated based on the membership price you have entered and the default billing frequency. Print - Email - Select how the new member wishes to be invoiced. You may select one or both options. The option selected will be the default used when invoices are delivered. Billing Address - Select a billing address. The drop-down list will be populated with addresses associated to the new member, or you may enter a new address by clicking the + button. Addresses displayed will be those associated to the Contact selected. Billing Email - Select a billing email. The drop-down list will be populated with emails associated to the new members, or you may enter a new email address by clicking the + button. Emails displayed will be those associated to the Contact selected. Contact - Select a contact from the drop-down list. The Contact selection sets the the billing contact for Scheduled Billing, as well as the membership billing contact. Contacts displayed will include the current organization and individuals, as well as parent organization and individuals if applicable. NOTE: If no selection is made, the Primary Contact for the organization will default, if no primary contact is assigned for the organization, the organization itself will be selected as the contact. Invoice Terms - The Invoice Terms associated to the membership type will populate by default. You may select different terms from the drop-down list if needed. Invoice Message - (Optional) Enter the message you would like included on the invoice. Click the Create New Member Project check-box. Click Done to save the new membership. NOTE: The default Primary individual contact for the organization is assigned as the primary contact for the membership. If no individual primary contacts exist for the organization, then the organization itself is the primary contact. See Changing Organization Primary Contact for information on changing the primary contact. 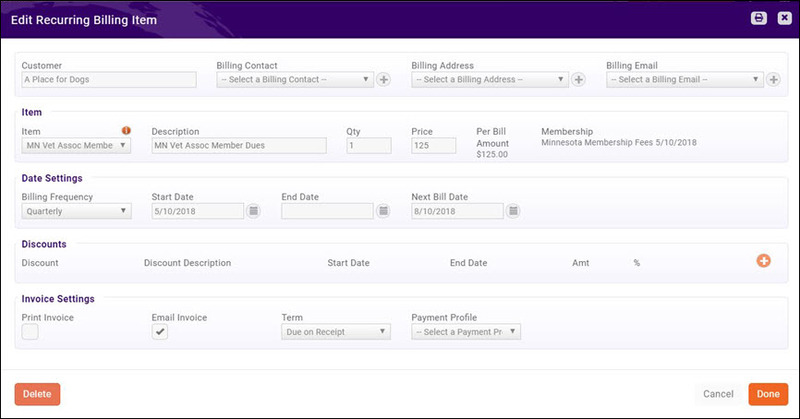 A billing fees schedule will automatically be created on the contact's Billing tab when a new membership is added. NOTE: Changes to a MEMBERSHIP RECURRING FEES may only be performed on the Profile tab. To view the details of the the fee items, click the hyper-link in the Description column. 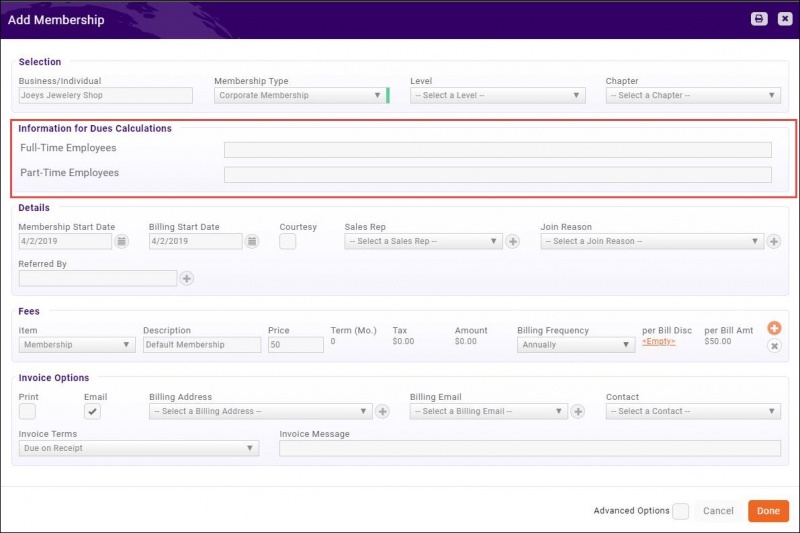 The Edit Recurring Billing Item screen will display all settings configured when you setup the membership, but all changes to this recurring membership billing should be performed on the Profile tab, in the Memberships section. See Managing Contacts for details on updating member information. Membership details such as the primary and billing contact may change over time. In the Memberships section, click the hyper-link for the desired membership. Select the new Primary contact from the drop-down list. You will be able to pick from the current organization, all contacts of the current organization, parent organization, and contacts of a parent organization (if applicable). Note: an email address may not be selected, it is derived from the selected contact's primary email address. NOTE: If you are working with an individual membership, you can select any related organization contacts, or their contacts in addition to the individual who owns the membership. In the Memberships section, click the hyper-link of the appropriate membership. Select the desired Billing Contact from the drop-down list. Contacts' email addresses cannot be selected but are derived from the selected contact's default/primary email address. NOTE: When the Membership Billing Contact is modified, the related scheduled/recurring billings that are tied to that membership will also be updated with the new Billing Contact information. On the member's Profile tab, in the Memberships section, click the hyper-link for the membership type. Select the desired Renewal Month from the drop-down list. On the Profile tab, click the Actions button in the Memberships section. Click the and select the desired contact from the drop-down list. NOTE: If limits have been set on the number of contacts that may be associated to a membership, the limit will be displayed. If the limit has been reached, the will be disabled. See Membership Setup Advanced Options for further details on setting membership limits. You can easily upgrade, downgrade, drop memberships, etc. from the member's Profile tab. Click the Actions button in the Memberships section. On the member's Profile tab, click the Actions button in the Memberships section. Click Upgrade Membership. The Membership screen will be displayed. Membership Type - Select the membership type to which the member is upgrading. Level: If this membership includes levels, select the level to which the member is upgrading. See Setup Membership Type Levels for further information on levels. Change Date: Enter the date the upgrade is to take effect. Staff: Optional, select the staff member handling this upgrade. Next Bill Date - If needed update the next bill date. Fees: The fee items associated with the new membership will automatically be populated. You may update these as needed. Invoice Options: The invoice options will automatically be populated based on this members history. You may update as needed. After completing the upgrade, evaluate what (if any) billing adjustments may be necessary, and adjust those on the member's Account tab. If a date in the future is selected, the Fees scheduled on the Account tab will be updated accordingly. A note indicating that the membership was upgraded will automatically be logged on the Communication tab. A new scheduled billing with the correct start dates (and no end date) is created. Did you know... The Membership Change Report may be used to view and analyze all membership changes. Click Here for instructions on running the report..
Click Downgrade Membership. The Membership screen will be displayed. Membership Type - Select the membership type to which the member is downgrading. Change Date - Enter the date the upgrade will take effect. Staff - Optional, select the staff member handling this downgrade. Fees - The fee items associated with the new membership type will automatically be populated. You may update these as needed. Invoice Options - The invoice options will automatically be populated based on this members history. You may update as needed. A note indicating that the membership was downgraded will automatically be logged on the Communication tab. End Date - Enter the date the drop will take effect. Drop Reason - Select a drop reason. You may select a drop reason from the list, or you may dynamically add a drop reason by clicking the + button. Notes - These notes are for internal use. This field is required. Invoices to Write Off - Any outstanding invoices for this member will be displayed. You may choose to write-off all, some or none of the invoices based on your business processes. Update Access Level for all Contacts - This setting allows you to define what access to the Info Hub ALL contacts of this membership will retain after the drop. Alternately, a list of all contacts is displayed, and you may define for each individual what access they will retain. Remove From Lists/Committees: Enable this check-box is you would like to remove the individual(s) from lists/committees. If de-selected, the membership will be dropped, however individuals will remain in lists/committees. A note indicating that the membership was dropped will automatically be logged on the Communication tab. Did you know... The Dropped Membership Report may be used to view and analyze all membership changes. Click Here for instructions on running the report.. The Adjust Membership action allows you to adjust the membership fees associated to a member. Click Adjust Membership. The Membership screen will be displayed. Update the fees as needed. The changes made here will only impact billing on a go forward, any fees that have already been invoiced will not be changed. A note indicating that the membership was adjusted will automatically be logged on the Communication tab. Additionally, when an adjustment is made the old billing scheduled will be ended, and a new billing schedule started. This is visible on the contact's Billing tab. While it is possible, it is NOT recommended to delete a membership. When deleting a member, you will delete all historical data associated to that membership. Additionally, all associated contacts will also be disassociated from this membership and the membership will be deleted. If a membership expired and was deactivated, or if a member dropped, the membership be easily reactivated on the members profile tab. The Membership page will be displayed to select membership type and associate fees. A note indicating that the membership was re-activated will automatically be logged on the Communication tab. Does the thought of having to calculate retention, churn, or the cost of acquiring a new member make your head hurt? For many association pros, crunching numbers is (unfortunately) a part of their daily grind. You don’t have to be a math person to use these seven common calculations to determine everything from renewal rates to average length of membership. Retention Rate is the percentage of members retained over a given period of time. This metric can be calculated if you know how many members you had at the beginning of a period, and many you had at the end of a period. The Dashboard will provide the Start Count and the End Count needed for this calculation. Click Dashboard in the left-hand navigation. Click the icon next to Total Memberships. NOTE: if you have removed this widget from your dashboard, click the Add Widget button to place it on your dashboard. Select Custom from the Duration drop-down list. Enter the desired dates in the Duration Date Range. Click Done. 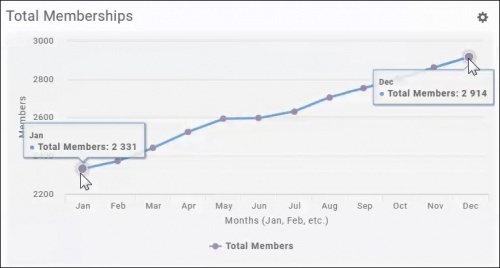 The Total Memberships widget will refresh displaying metrics for the desired date range. Generate the New Membership report to find New Members. Generate the report for the same date range used above. See New Membership Report for further instructions on generating the New Membership Report. The Lapse Rate (Churn) is the percentage of members that discontinue their membership over a given period of time. The Start Count is calculated as described in Retention Rate above. The Dropped Membership Report may be used to calculate Dropped Members. Generate the report using the same date range used to find the Start Count. See Dropped Membership Report for instructions on generating the report. Renewal Rate is the percentage of members that renew their membership over a given time period. NOTE: Using the criteria described below will get an overall Renewal Rate, not specific to a certain year - but for all time. You could use this to judge if you are moving the right direction each time to run this stat. The Membership Report will provide you with the information to calculate the Renewal Rate. You will generate the report twice, each with different filtering options. Set Membership Status set to Active and Courtesy. Add a Criteria / Filters for Membership Start Date Before and set the date to the first date of your search criteria. For example if you are looking for your renewal rate for up until 1-1-2017, you would set the before date to 1/1/2017. In the example above, # of Renewals = 2560. Second: Generate the Membership Report with the following filtering criteria to find Eligible Members"
Set Membership Status set to Active, Courtesy, Dropped, Expired. Do not include Non-Member or other statuses since these were never up for renewal and thus not part of your eligible members. Add a Criteria / Filters for Membership Start Date Before and set the date to the first date of your search criteria. For example if you are looking for your renewal rate for 2017, you would set the before date to 1/1/2017. In the example above, Eligible Members = 3180. See Membership Report for further instructions on generating the report. Lapse Rate is calculated as described above in Lapse Rate (Churn). Member Lifetime Value (MLV) is the measure of monetary value of member based on projected length of membership. The Total Spending by Contact Report can be used to calculate the MLV. Set the Membership Status criteria to Active and Courtesy to see all dues and non-dues generated by your members. To get the Net value, you need to subtract your operating costs from that total. You can get your operating costs from your accountant. This will give you your Net Member-paid revenue. The End Count can be obtained from the Retention Rate calculation, described above. AMT can be obtained from the Average Membership Tenure (AMT) calculation, described above. In 2017, there were 3,000 total members who collectively invested $550,000 in dues and contributed $325,000 in non-dues revenue. The operating costs were $650,000 and the organization’s AMT (average membership tenure) was 17 years. Member Acquisition Cost (MAC) is the total monetary cost associated with recruiting a new member. To effectively maintain and/or grow an organization, it is necessary to assign an average monetary value to potential membership sales. 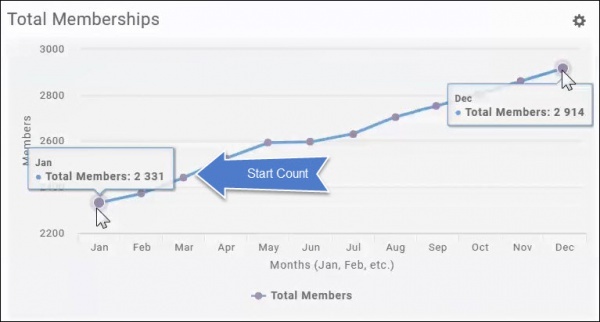 Calculate the # of new members as described in Retention Rate above. The Total Recruitment cost would be available from your accountant. At the end of 2017, 75 new members had joined and $28,875 was spent on new member recruitment. The MLV to MAC ratio is the measurement of the relationship between the lifetime value of a member and the cost of acquiring that member. Best Practice: Aim for 3:1 as the target ratio. Calculate your Member Lifetime Value (MLV) and Member Acquisition Cost (MAC) as described above. Example: In 2017, the average lifetime value per member was $1,275. $32,000 was budgeted for member recruitment and $28,875 was spent. Breaking down those numbers further means the budgeted recruitment cost was $425/ new member and the actual recruitment spend was $385/ new member. 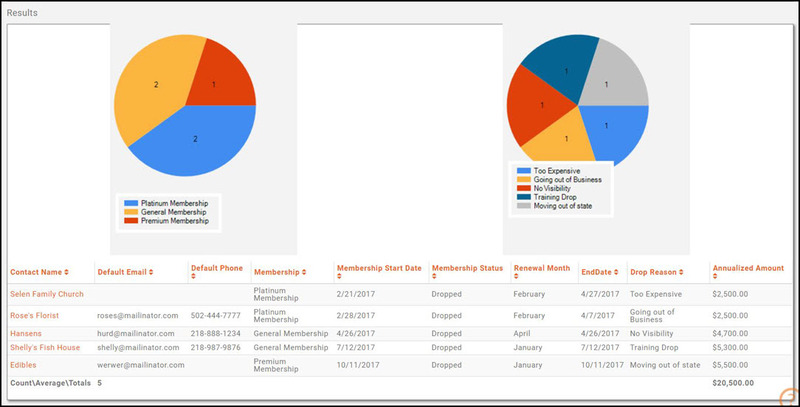 The Membership Chamber Report provides you with a way to view and analyze membership type changes, as well a fee changes. For example, if you have had a major marketing campaign to upgrade members to a higher membership level, you can generate this report based on the Membership Purchase Type and a specified change date range. You could also include Sales contact in your report, if you want to see which sales person was responsible for the upgrade. The Membership Referral Report allows you to generate a list of members, and the contact who referred them to your organization. Select desired display options. The system is setup with default display options. Click the drop down arrow on Fields to Display to add or removed display options. Select Summarize By. This is an optional setting that will allow you to group the results of your report. For example, if you wish to group the report by the contact who referred a member, you would select Contact Name. In the example above, the report is filtered on contacts who referred members, i.e. Edibles referred Antiques on Main. The Membership Report allows you to generate a list of all of your members based on membership type. You can filter this report to a specific membership type and membership status, or by custom filter criteria. For example, if you want to generate a list of members renewing in a specific month, you can select Renewal Month as Criteria/Filters. Add additional Criteria/Filters - optional. Select Summarize By. This is an optional setting that will allow you to group the results of your report. For example, if you wish to group the report by membership, you would select Membership. The report shown above is filtered on all memberships, renewing in February. The report is summarized by membership type. The Mail Merge feature allows you to take the results from your Member report and perform a mail merge via MS Word. Several templates are setup by default, including a Member Card template. Define the desired filters for your report. NOTE: The report Display Options must include the field you wish to include in your MailMerge. Click the down arrow on the Run Report button. Select the desired template from the list. NOTE: Only templates designed as Member type will be available for selection. If needed, click the to upload a new template. See Setting Up Document Templates for further information on configuring and uploading templates. Select the desired output format: PDF or Word Document. The file will download, and you can make any necessary changes prior to printing out your badges. 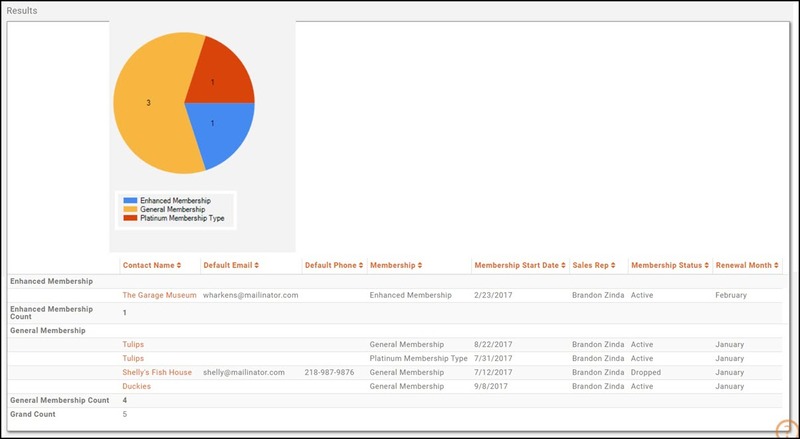 The New Membership Report allows you to generate a list of all new memberships based on membership type, membership status, specified date range, and custom search criteria. This report can be useful to provide annual statistics on new memberships. Select your search filtering criteria. For example, if you want to see year to date statistics, select This Year from the Start Date' drop-down list. Optional - Enter a Search/Filter query. For example, if you would like to view new membership sales by a specific sales person select Sales Rep. Select Summarize by criteria. This optional field allows you to select how you wish report results grouped. For example, you may choose to group results by membership type. The Renewal Membership Report allows you to generate a list of all members, with the associated renewal month. You may choose specific renewal months to narrow report results. The Dropped Membership Report allows you to generate a report of dropped members based on date range, membership type and sales person. The report can help you in identifying the reason members drop, as well as view the annualized revenue loss due to the drop. Optional - enter additional Criteria/Filters. For example, if you have a drop reason called Too Expensive, you could filter on that specific Drop Reason to analyze the number of members who have dropped due to cost. Select Summarize By criteria. This optional field allows you to select how you wish report results grouped. For example, you may choose to group results by drop reason. The Sales by Member Report provides a way to analyze sales generated by all or specific members. The report may be filtered by member, specific date range, and custom search criteria. NOTE: This will display sales totals, whether the sale has been paid for or not. Select Sales by Member Report. Select your search filtering criteria. For example, you may wish to generate the report for a specific date range. Optional - enter additional Criteria/Filters. For example, if you wish to generate the report based on membership type, select Membership Type. Select Summarize By criteria. This optional field allows you to select how you wish report results grouped. For example, you may choose to group results by contact name. The Total Spending by Contact Report allows you to view total spending for the contacts in your database. The report may be filtered on specific types of goods and services to help you to understand how various goods are being utilized. Select Total Spending by Contact Report. Select your search filtering criteria. For example, you may wish to generate the report for a specific Good/Service Type to view spending for just that type. Optional - enter additional Criteria/Filters.